Highlights: Well-seasoned beef that was cooked to perfection. 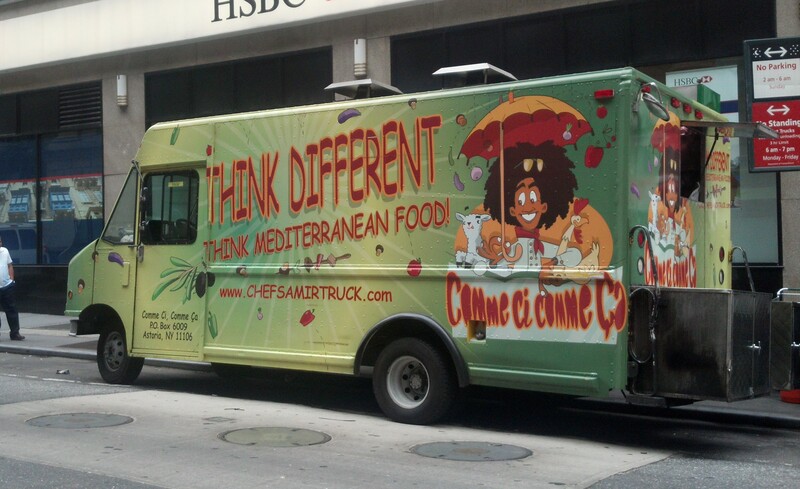 Comme Ci Comme Ça has been making a name for itself since the early days of the NYC food truck scene. One of the more talented at social media and mastering the internet, the truck is always easy to locate on my assorted arsenal of food truck finders. 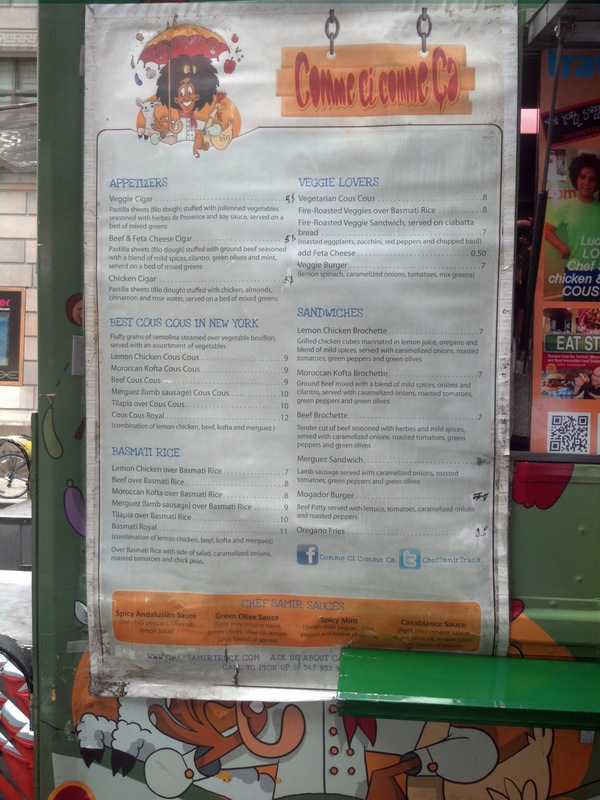 The frizzy-haired chef can easily be spotted in a variety of different websites, and has even recently made his way onto the progressive insurance food truck poll. But all this is moot if Chef Samir can’t muster up the food to back up his online identity. Unfortunately, his meal[for the most part] did not leave a lasting impression. This jolly green giant of a truck should be quite easy to spot from any vantage in the city. The truck tends to frequent the same 2-3 spots throughout the weeks so if you’re not midtown west or financial district you might be out of luck. I enjoyed the playful cartoon likeness of the head chef sprawled on the side of the truck, although the text that accompanied the logo (‘think different’) seemed ripped directly from a mid-80s apple commercial. I really appreciate the truck’s incorporation of a customer loyalty card into their business. Although I neglected to get one (too many other trucks to review!) I wouldn’t mind having every fifth or sixth meal for free. It’s the little things that keep customers coming back, and something like this will go a long way. The dish I ordered (Mediterranean koftka over couscous) was one of the better presented dishes from a food truck that I’ve had. The items making up the meal were presented radially with sauces drizzled across the top. I was excited when I first opened the metal container. Portion was good to average. Six (small) meat chunks with about 10 different vegetable items. A pretty thin layer of couscous underneath it all. I was full when I finished, but there was nothing left on the plate. Chef Samir’s menu was probably the biggest I’ve seen to date. Granted, a lot of the items closely resembled each other and only differed by a few ingredients. I still respect the effort, and CSCS will remain the reigning champ in this area. Prices were reasonable but a bit misleading. The online menu claimed one (lower) price whereas the truck has recently upped the price of several dishes. A dollar’s not going to break the bank but it still annoyed me knowing that I was being [a bit] overcharged. Now for the real question: what separates CSCS from your standard chicken over rice-type street vendor? To be honest, not that much. Perhaps the items on the plate are a little different, but the flavors are much the same. His ‘Casablanca’ sauce is dangerously close to your run of the mill white goop that gets splattered on to countless NYC gyros. 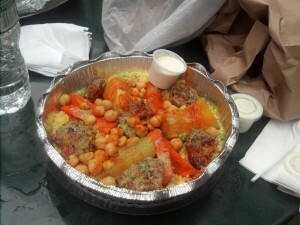 His cous cous/rice tastes much like its yellow counterpart that can be found in many other locations around the city. When you go through with a more fine-tooth comb, you’ll find subtle differences in the food. The two different hot sauces I had added a nice kick but nothing outrageous and memorable like fishing shrimp. The vegetables, although decently seasoned, were a bit overcooked. Overall, my favorite part of the dish was the meat. It had the most shine-through flavor and was not at all overcooked. I appreciated the hint of medium-rare texture that came through and complemented the rest of the meal. All things considered, chef Samir gets an A for effort in all of his endeavors except for one: the food. And in the end, one breakthrough element is not enough for me to adopt a new lunch spot or even a second punch in the visitor card.